The old woman had a fanatic’s face, if ever he saw one; and Marion Sharpe herself looked as if the stake would be her natural prop if stakes were not out of fashion. Blair isn’t the only one to associate the Sharpes with witches: “Give these midland morons a good excuse,” cautions his fellow lawyer Ben Carley, “and they’ll witch-hunt with the best.” Suspicion does quickly turn to hostility and violence: as long as they are unable to prove their innocence, the Sharpes become victims of this predatory mentality. To an extent, Tey is just continuing the paradoxical strategy of any Golden Age “cozy”: a seemingly peaceful English village like Miss Marple’s St. Mary Mead, or King’s Abbott in The Murder of Roger Ackroyd, turns out to be a festering pocket of greed, jealousy, spite, and malevolence. The pastoral tranquility of the setting is a façade; the story’s central crime is not an aberration but an eruption, and the restored calm can only ever feel precarious, so certain are we that we’ll be back again for the next installment. Tey cares so little for the puzzle aspects of the story, though, that this formulaic oddity of the setting moves from background to foreground. The charm of the classic English town is compromised by its revealed dark side. “Don’t worry, sir,” a police officer says to Robert, who’s worried about the Sharpes’ safety; “Nothing’s going to happen to them. This is England, after all.” It turns out that he’s right about that last point, just not about what it means. The overall effect is not at all the nostalgic one often associated with “cozies”: just as Robert feels a mixture of pleasure and despair at the tranquil continuities of his own life before the Franchise affair, we’re prompted, surely, to wonder if this is a world that should be preserved or destroyed, policed or subverted. One of the most unnerving aspects of the novel for me was that Betty Kane’s mean-spirited deception made all our “good guys” so angry that they started sounding an awful lot like bad guys. “An attractive face, on the whole,” Robert says to his cousin as they contemplate Betty’s photo. “What do you make of it?” “What I should like to make of it,” is the reply, “with slow venom, ‘would be a very nasty mess. '” As Robert prepares to face her in court, he declares his intention to “undress her in public . . . to strip her of every rag of pretence, in open court, so that everyone will see her for what she is.” He’s outraged that she might get away with her scheme and “go on being the centre of an adoring family”: “the once easy-going Robert grew homicidal at the thought.” When the truth comes out, and it’s revealed that whatever her other lies, her bruises are real, the general attitude seems to be that a beating was no worse than she deserved, and nobody seems shocked at the remark that “it was a pity her mother hadn’t done the same thing ten years ago.” Nobody, for that matter, censures the grown — and married — man who makes this statement for having an affair with a fifteen-year-old girl. Is she really so appalling? At what point does she, like the Sharpes, slip from accused to victim? What threat does she really represent that the jury can reach a unanimous verdict without even hearing the remainder of the case (or retiring to discuss the evidence) and it’s greeted as justice? She’s shunned so completely that we never even find out what happens to her. Guilty though she certainly is, is she also a scapegoat, a focal point for disruptive forces that the community abhors and wishes to banish? Is it she who is really the witch, or some kind of shape-shifter, someone who has the terrifying capacity to make guilt look like innocence? Is it her real crime to embody and thus expose the deceptive safety of the world they all live in, making explicit a truth they all prefer to deny? “She can never again take a step onto green grass,” Marion says sympathetically of Betty’s mother, “without wondering if it is a bog.” But it wasn’t Betty who set The Franchise on fire and watched, face “alive with gloating,” as it burned to the ground. You serve up a timely reminder that I have not yet gotten around to reading this Josephine Tey novel. I enjoyed The Daughter of Time and Brat Farrar, but for some reason I never got around to The Franchise Affair. Thank you for the reminder. What a thought-provoking review! You have me looking about wondering where my own copy of the book is, because now I want to re-read it with your comments in mind. Thank you. You remind me that it is too long since I read and Tey and that I should search my copies out. Reading what you say about the line between accused and victim made me think of the novels of Barbara Vine and the less well remembered Minette Walters, both of whom, I think have explored the same sort of territory. I always find it jarring when the author’s attitude towards a character seems utterly different to my own. It’s strange because it feels a bit like the author doesn’t know what sort of character s/he has written — particularly with something like this, where the author seems to be blaming someone that you feel is sort of (or very much) a victim. I am ashamed to say that I have still yet to read any Josephine Tey books apart from Daughter of Time. It is a bad state of affairs and must be rectified soon. As further inducement to potential readers (including myself), The Franchise Affair was ranked as #11 in the Crime Writers’ Association’s list of the top 100 crime novels of all time. 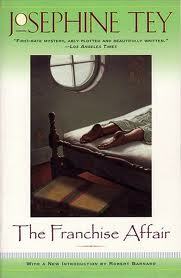 The Mystery Writers of America, being less effusive over it, ranked The Franchise Affair as #81 out of 100. Huh – it’s good, but I wonder why it’s considered that good!